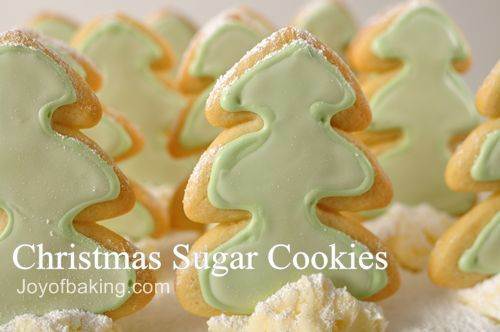 Christmas Sugar Cookies make perfect cut out cookies as they keep their shape when baked. 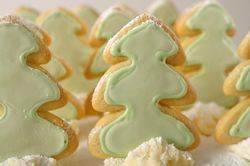 To celebrate the Christmas season I have baked these sweet and tender cookies in the shape of Christmas trees that have been frosted with green tinted royal icing. To present them in a unique way, the decorated trees are placed into small mounds of confectioners frosting. The finishing touch is to dust the tops of the trees with powdered sugar. Royal icing is the perfect icing to frost sugar cookies. It is not the same as the confectioners' frosting commonly used by home bakers to cover cakes and cookies. Royal icing is different in that it dries to a wonderfully smooth and hard matte finish that has long been a favorite of professional bakers to cover wedding and Christmas cakes. It is simply a mixture of powdered (icing or confectioners) sugar, lemon juice, and raw egg whites but due to the risk of salmonella when using raw egg whites, I have also included a recipe using confectioners sugar and meringue powder. Now, meringue powder is a fine, white powder used to replace fresh egg whites and is made from dried egg whites, sugar, salt, vanillin and gum. When beaten with water and confectioners sugar it has the same consistency as icing made with fresh egg whites. However, I do find that royal icing made with meringue powder does not taste as good as icing made with egg whites, so I suggest adding about 1/4 teaspoon of almond extract when making the icing. You can find meringue powder at cake decorating or party stores (like Michaels) or else on-line. Now, the royal icing recipe I have given is for covering or "flooding" the entire surface of the cookie. If you want to pipe a border first around the outside edge of the sugar cookies as I have done in the picture, the royal icing needs to be thicker, so it is of piping consistency. To make a small batch, beat together one large egg white, one teaspoon of lemon juice, and about 2 - 2 1/4 cups (230 - 285 grams) of confectioners sugar until the frosting is stiff (like a meringue) with shiny peaks and of piping consistency. Color if desired. Place in a piping bag with a small plain tip and pipe a border around the outside edges of the cookies. Remove one half of the chilled dough from the refrigerator and, on a lightly floured surface, roll out the dough to a thickness of 1/4 inch (1 cm). (Keep turning the dough as you roll, making sure the dough does not stick to the counter.) Cut out cookies using a lightly floured tree cookie cutter and transfer cookies to the prepared baking sheet. Place the baking sheets with the unbaked cookies in the refrigerator for 10 to 15 minutes to chill the dough which prevents the cookies from spreading and losing their shape while baking. Makes about 20 - 4 inch (10 cm) cookies. For Confectioners Frosting: In an electric mixer, cream the butter until smooth and well blended. Add the vanilla extract. With the mixer on low speed, gradually beat in the sugar. Scrape down the sides of the bowl and beater. Add the milk and beat on high speed until frosting is thick and smooth. To Serve: Place small mounds of confectioners frosting on your serving plate. Cover and place in the refrigerator until the frosting is firm. Then, just before serving, gently place the decorated cookies into the frosting.